The customer is firmly in the driving seat and with it comes a required change in how you build and nurture relationships with potential and existing customers. Companies that put the customer at the heart of their organization are experiencing an increase in customer lifetime value and a reduction in churn. By being customer centric. Becoming a truly customer centric organization takes time, but you can start of all small. We share 4 best practices to becoming a customer centric company. Customer centric is a way of doing business with your customer in a way that provides a positive customer experience before and after the sale in order to drive repeat business, customer loyalty and profits. But, a customer-centric company is more than a company that offers good service. Both Amazon and Zappos are prime examples of brands that are customer centric and have spent years creating a culture around the customer and their needs. Their commitment in delivering customer value is genuine – In fact, Zappos is happy to fire employees if they do not fit within their customer centric culture! But, how important is being customer centric? The good news is that’s becoming very important! Econsultancy recently asked what the most important characteristic is in order to establish a truly “digital-native” culture. The answer to that question and leading the responses with 58% was to be customer-centric. Executing a successful customer-centric strategy doesn’t happen overnight. You need to start somewhere and in this case, it’s understanding the definition of customer centricity. Customer centricity is not just about offering great customer service, it means offering a great experience from the awareness stage, through the purchasing process and finally through the post-purchase process. It’s a strategy that’s based on putting your customer first, and at the core of your business. When you put your customer at the core of your business, and combine it with Customer Relationship Management (CRM), you collect a wealth of data, which gives you a full 360 view of the customer. This can then be used to enhance the customer experience. Not only does focusing on the customer make sound business sense, but research by Deloitte and Touche found that customer-centric companies were 60% more profitable compared to companies that were not focused on the customer. The power shift between brand and customer happened during the economic downturn. Customers became more selective in which brand they chose to spend their money with – The winning brands were the ones who treated their customers with respect, with great service, and built a relationship with them that still exists today. And during the same time as the recession, social media marketing and social selling exploded onto the scene and mobile became a major part of the customer journey. Customers can now compare products and services in real time and across multiple devices, which has presented a huge challenge for many brands. Research has found that companies are struggling with this change and are unable to become a customer-centric organization – with the biggest challenge not being able to share customer information across departments. You need to start with your customers, not your products and focus on what your customers want to do. By designing your company from the customer’s perspective, your organization will be focused on the customer’s needs. By being customer centric, you will want to anticipate customers’ needs and delight them with products and services they may not have thought of, but will immediately fall in love with (i.e. the Apple iPhone or iPad). Thus, the customer centric brand creates products, processes, policies and a culture that is designed to support customers with a great experience as they are working towards their goals. Brands that are committed to customer centricity are passionate, and truly believe the customer comes first. They believe that without the customer, they cannot succeed in business (which is true) and want to see the world through the customer’s eyes. Marketers inside customer-centric organizations understand what customers want, and use customer data to capture customer insights and share this across the organization. Brands that are committed to customer centricity focus on what the customer wants and needs, and develop products and services around that. Brands that are committed to customer centricity focus on building relationships designed to maximize the customer’s product and service experience. Brands that are committed to customer centricity analyze, plan and implement a carefully formulated customer strategy that focuses on creating and keeping profitable and loyal customer. 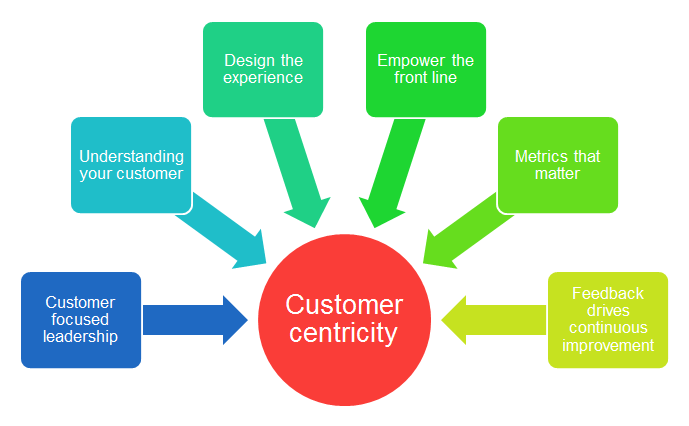 How to measure the success of a customer centric company? Not every organization will have the same customer metrics to measure customer centricity. However, the two most important customer centric metrics that should be carefully monitored are churn rate and customer lifetime value. Companies with a high retention rate grow faster. The key to success is to understand why people leave, and why people remain customers. To calculate the churn rate, measure the number of customers who left in the last 12 months divided by the average number of total customers (during the same period). For a customer-centric business, the most valuable asset is the customer. The profits generated during the retention phase are often known as customer lifetime value or CLV. Customer Lifetime Value (CLV) measures the profit your organization makes from any given customer. To calculate CLV, take the revenue you earn from a customer, subtract the money spent on serving them and adjust all of the payments for time value of money. Another way to calculate it is to take average order value and repeat purchase rates. For example, if your average order value is $100 and the repeat purchase rate per customer is 20% your estimated CLV is $120. Calculating the customer lifetime value helps you understand why it makes sense to invest in keeping your customers. It’s a great way to get an understanding of your customer portfolio and to segment your customer. The shift towards becoming a truly customer centric organization is both complex and long but, do not be put off by this as even the smallest changes to policy and processes can have a significant benefit for both employee and your customer. Being a customer centric organization is the Holy Grail towards unlocking the true potential of customer value. Always put yourself in the shoes of the customer and minimize customer effort and maximize customer value. Do you consider yourself a customer centric organization? CRM software plays an important role in becoming customer centric as this is where all of your customer data is stored. See how SuperOffice CRM can help your business by signing up for a free demo. This article is true, CRM can bring in customer centric strategy. I am using a CRM and it has build more customers and also helped in constant follow-up of customers. Thanks for the comment, Nikhil! I am a CRM blogger with about five years of exprience. I agreed completely to the content of this article. I would love to also be a contributor to this blog as well. Thanks so much Steve for this article. Thanks, Niyi! Glad you liked it. An interesting article. Organizations need to realize that focusing their initiatives towards building a customer centric culture is paramount. Building a customer centric culture facilitates not just business offerings but also processes and policies that can help in providing a great customer experience. Although, the initiative towards customer centricity can be led by anyone in an organization, leadership must lead by example and inspire entire workforce to shift their focus. Great article! An easy read and yet very impactful. I'm faced with many of the customer centric challenges the article references. I plan to use some of the tips mentioned. Great article Steven. Hope you establish new customer-centric strategies in the future! Great blog, good information is given about customer centric strategies.It was worth reading.Thanks for posting the blog. Thanks Steven for this article. You’re absolutely right. Today’s customers have lots of requirements. I thinks a customer centric strategy is the best way. Hi Steven, Can you direct me to the Deloitte research that shows that customer centric companies are 60% more profitable? Thanks. Well Said Steven! "By being customer centric, you will want to anticipate customers’ needs and delight them with products and services they may not have thought of, but will immediately fall in love with." Hi Steven, are you able to indicate source of research that led to graphic on challenges faced in becoming truly customer centric? I really like your blog! Steven. Customer-centric is an approach to doing business that focuses on providing a positive customer experience both at the point of sale and after the sale in order to drive profit and gain competitive advantage. This article is a good informations about customer centric strategies. Thanks, John. Appreciate your kind words! I really learn a lot from your article. Good job ! Thanks Steven for this article. It's great! Hi Steven Macdonald! This is a very amazing and informative blog post. This post must be read by everyone who has an SMB business or who has just started their own business. Personally I have gained a lot from this blog. Thank you. Being customer centric is a way of living into the future by anticipating customer needs and creating value through products that meet those needs. It is not just good for business but makes good business sense. I wish companies always keep this philosophy in mind. Thanks, great job. Steven, Thank you for sharing this informative post on customer centricity and I love reading this. You have covered some unique areas, some that experts don't usually share with others, so I will definitely share your post with my network. Hello Steven, thanks for sharing this informative post. This is a great guide to understand a Customer Centric Strategy. Great use of images and diagrams. Really, appreciable covered all the necessary areas of being customer centric. Thank you, George. Good luck with your exam of customer centricity. Really good article, thank you for sharing. I will certainly be sharing with my customers!